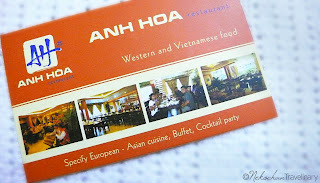 Anh Hoa, this was our first resto in Hanoi, and first lunch too. The first one should be remembered, rite? We'll see.. 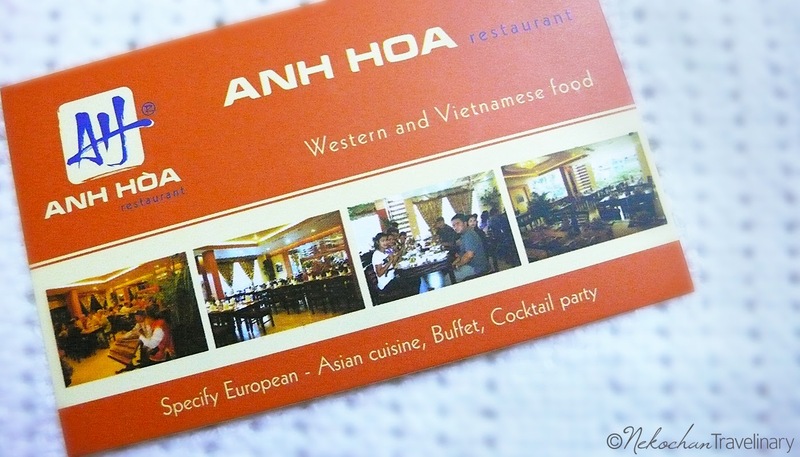 According to Anthony-our guide, this is kinda big resto and usually booked for group of tourist or company's gathering. Located relatively far away from Hanoi's city centre, this roadside resto has five storeys quite-spacious-room (compared with Old Quarter's). On street level there's a French bakery on the left and resto's receptionist desk on the right side. The narrow road in front of this resto was crowded with many vehicles come and go. You may check from online reference here as I forgot to take photo of its outside look. Anthony took us to the second floor (there's an elevator beside the stairs) and talked to the waitress to confirm our booked lunch menu. I was personally disappointed with the dining table they provided us. When I tried to ask for another table (through our guide as the translator) they annoyingly refused. Their reason, the reservation was made for 2 persons only, so they gave a table that (tightly) FITS for 2 persons too. Oh c'mon!! They had lots of EMPTY tables around, but gave us this tiny table! I would definitely complain loudly if we're in Indonesia, but I didn't want to ruin my day by making problem here. 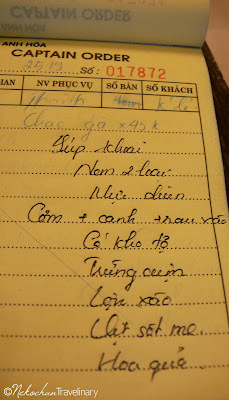 Each of us got a glass of hot Vietnamese tea, dunno was it refillable or not, but one glass was enough for us at that time. If we want some water, we had to pay additional charge for bottled water 'coz it wasn't include in set menu. Bottled water in a restaurant usually priced twice or even more expensive than at store/supermarket outside. Whew, no way! The tea itself has yellowish and a bit green color, not too thick, also tolerable bitter taste. 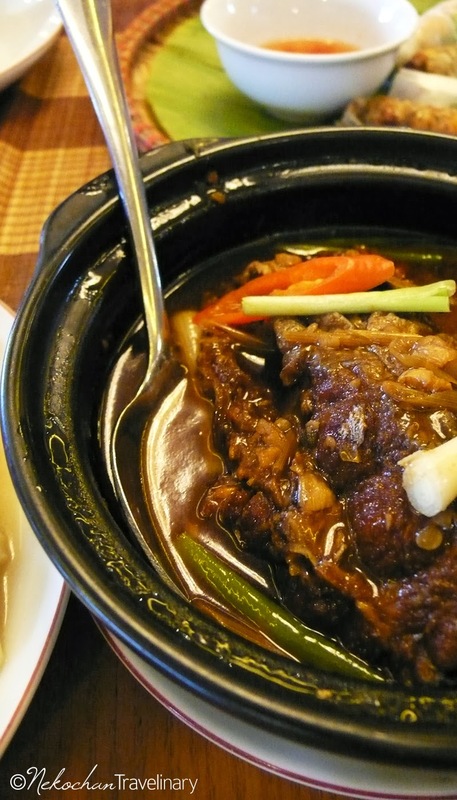 It was good to neutralize savory taste on our tongue. Our set menu list. Translator, please? 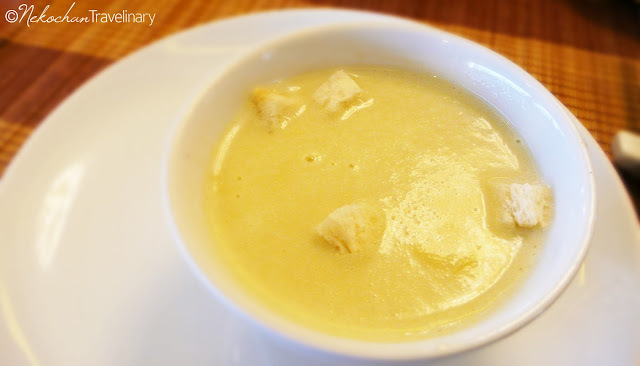 Warm soup as an appetizer, good! It was creamy, thick, savory, warm, and yummy! Basically I'm a cream soup lover, so this kind of soup would rarely failed for me. We were very excited with those spring rolls, which unfortunately only 4 small pieces served in a big woven bamboo 'plate' covered with young banana leaf. Two of them are fried rolls (nem rán) and two others are fresh rolls (nem cuốn). 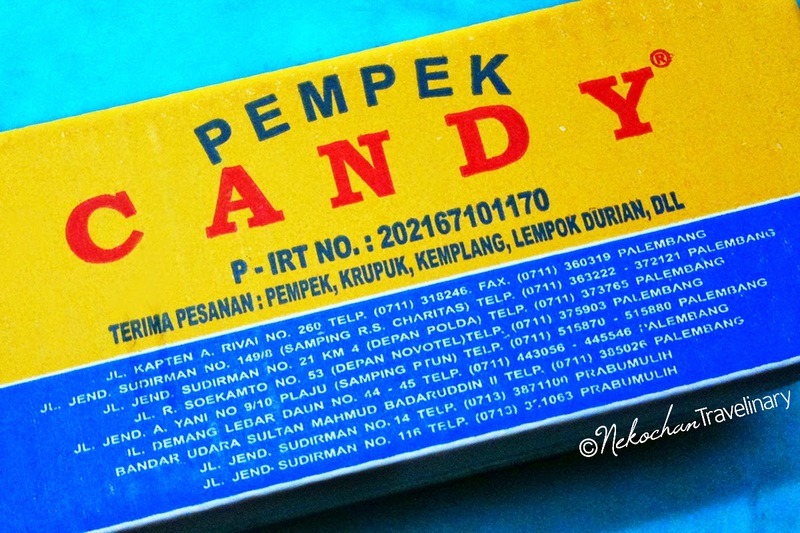 We like them the most, so yummy... they rolled smoothly in our throat. We wanted more!!! The squid was thinly breaded and fried until golden brown. An unusual thing for us, the squid was cut lengthwise instead of ring-shaped. It became too thick, less crispy, and chewy like a gum.. yayyy, didn't like it. Each menu came with dipping sauce which look similar in color but actually different. The dipping sauce for spring rolls called nước chấm while the dipping sauce for squid was more like Bangkok's style chili sauce ("Sambal Bangkok" in Indonesia) without fish sauce. Nước chấm is basically made from nước mắm (Vietnamese fish sauce), lime juice or vinegar, sugar, and water. 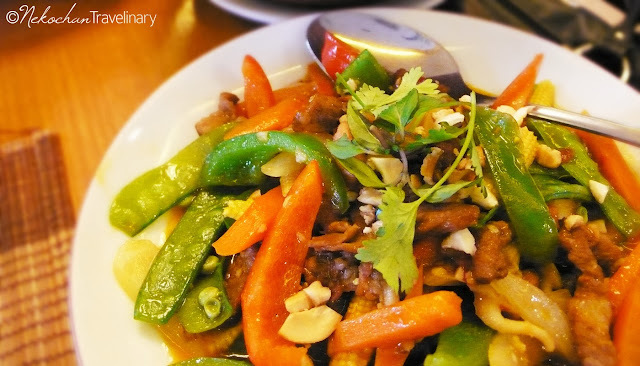 For extra taste, minced garlic and minced red chillies are usually added into the mixture. We want MORE spring rolls!!! This was simply an omelette with chopped mushroom, then thinly sliced into that form. Six pieces of omelette arranged like flower petals around a tiny saucer of nước mắm pha (mixed fish sauce) in the middle. 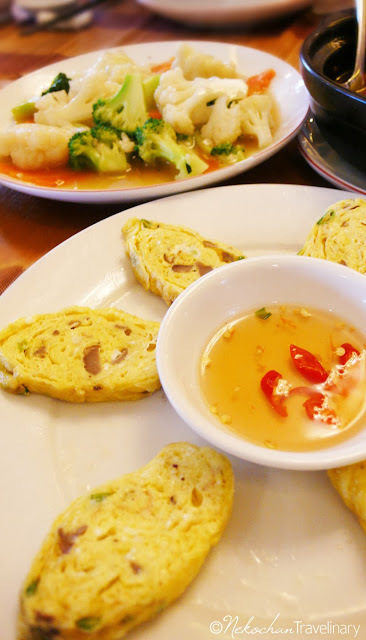 The omelette was tender and juicy, yet not too salty so it must be dipped in its sauce. At the back was the sautéed vegetables (mostly cauliflower, together with broccoli and thinly sliced carrots) cooked in oyster sauce, I guessed. Not so special, just like a vegetable menu in Chinese food resto, but I like its 'lightness' compared with meat menus. Fried fish cooked in oil and herbs. We were not sure is it saltwater or freshwater fish 'coz we got only a part not the whole fish. It was quite a big fish, its meat has an average dryness, and not too much small bones. I like the way they cooked the fish. It was fried briefly before cooked in oil, so it was crisp on the outside but still tender inside. The spices gave fragrant aroma and rich flavor that felt delicious on my tongue.. liked it! Thinly sliced duck meat (I dunno which part) cooked with thick-browny sauce, I thought they used oyster sauce in it. 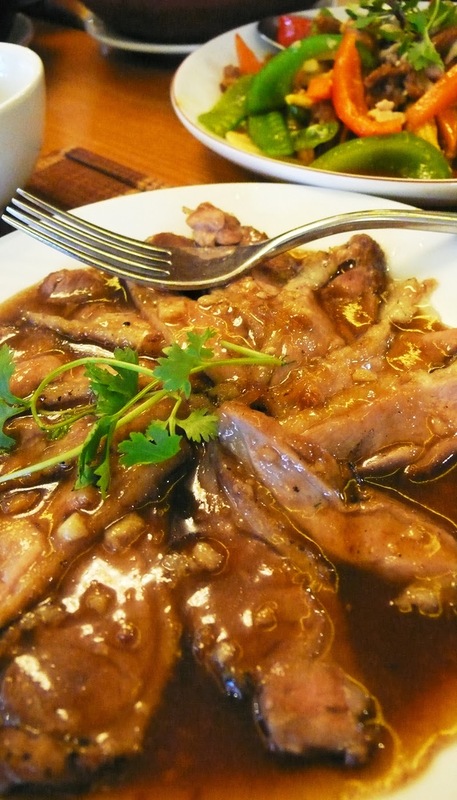 The sauce was delicious, but for the duck meat, one or two slices were enough for me. Ya.. ya, blame my picky eating habit, especially to meat dishes. As we predicted before, we could not finish those big feast. 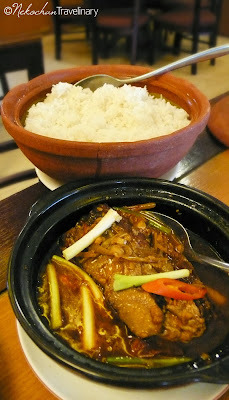 They were absolutely too much for our tummy, moreover their extra savory flavor (too much MSG, maybe?) made us feel full faster. 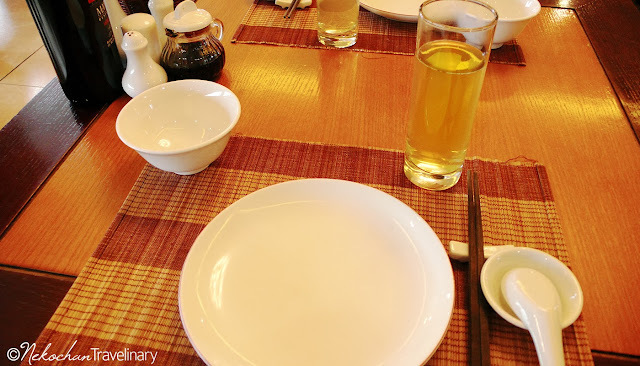 Most of the dishes tasted like commonly Chinese food that we could find everywhere, not Vietnamese specialities as we expected. We're disappointed actually, but we could blame no one. As Anthony said, the company usually choose "safe" dishes to fit the general taste for all guest. Owkayy, nevermind, at least we were full enough to continue our journey that day.